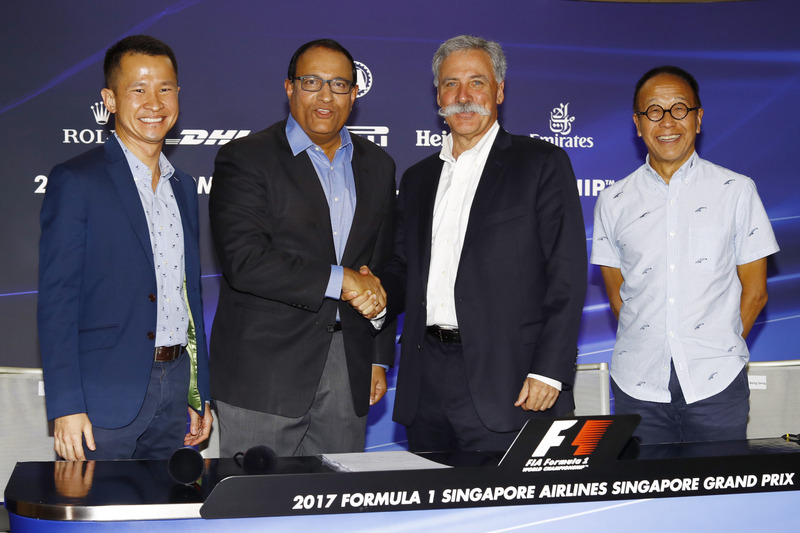 Singapore, 15 September 2017 – Singapore GP Pte Ltd and Singapore Tourism Board today announced that they will continue to host the FIA Formula 1 World Championship for four more years from 2018 to 2021. The announcement comes against the background of a year-to-date 19% increase in ticket sales, with the weekend sales still to be included. In its first decade, the race has yielded significant economic benefits, attracting over 450,000 international visitors to Singapore and about S$1.4 billion in tourism receipts1 . With more than 90% of the race organisation sub-contracted annually to Singapore-based companies, the race also contributes to the local economy, over and above the tourism outcomes. This event has also showcased Singapore as a beautiful, vibrant and attractive destination to over 780 million international broadcast viewers. “The Singapore Grand Prix is a signature Formula 1 race and therefore we are very pleased that it will continue to feature on the calendar for a further four years. The first ever night race in this sport is one of the most thrilling events of the year, taking place against the stunning backdrop of Marina Bay. Formula 1® racing began in 1950 and is the world's most prestigious motor racing competition, as well as the world's most popular annual sporting series. In 2016 it was watched by 400 million unique television viewers from over 200 territories. The 2017 FIA Formula One World Championship™ runs from March to November and spans 20 races in 20 countries across five continents. Formula One World Championship Limited is part of Formula 1, and holds the exclusive commercial rights to the FIA Formula One World Championship™. Formula 1 is a subsidiary of Liberty Media Corporation (NASDAQ: LSXMA, LSXMB, LSXMK, BATRA, BATRK, FWONA, FWONK) attributed to the Formula One Group tracking stock. The F1 FORMULA 1 logo, FORMULA 1, F1, FIA FORMULA ONE WORLD CHAMPIONSHIP, GRAND PRIX and related marks are trade marks of Formula One Licensing BV, a Formula 1 company. All rights reserved. Singapore has successfully hosted the only night race in Grand Prix history and Asia’s only street race on the Formula 1® calendar at the Marina Bay Street Circuit in downtown Singapore since the inaugural race in 2008. For more information, visit www.singaporegp.sg or follow us on Facebook, Twitter, Instagram or Snapchat @F1nightrace. Official hashtags: #SingaporeGP & #F1NightRace. The Singapore Tourism Board (STB) is the lead development agency for tourism, one of Singapore’s key economic sectors. Together with industry partners and the community, we shape a dynamic Singapore tourism landscape. We bring the Passion Made Possible brand to life by differentiating Singapore as a vibrant destination that inspires people to share and deepen their passions. For more information, visit www.stb.gov.sg or www.visitsingapore.com or follow us on Twitter @STB_sg (https://twitter.com/stb_sg).